It is a long standing joke between Chooch and I that I have a technology destroying aura (TDA). It was with understandable trepidation that I went about the steps necessary to post the second episode of my new podcast, Girls’ Rules. Now, I have done editing for well over a year on our other podcasts, but have only started learning all the other production pieces with this new project. I am striving towards being able to confidently do the full production myself, and while I’m making great strides I had yet to do it all by myself without Chooch. I decided the best thing to do was to charge forward while he was at work so that I would be unable to lean on him. Full disclosure – I did call him twice, but happily did all the steps myself including posting it to my site and to iTunes. Still nervous, I sent M.A. in PA a direct message in the hopes that she could error check the episode for me. The site post was fine, but the iTunes post was a two minute truncated song instead of my one hour+ long episode. For some reason, I was completely unable to see the episode on iTunes at all, but was unable to find an error with the posting I made. Being clueless on how to fix the problem, I just let it sit until Chooch got home. I was greatly relieved by what he discovered, as it was something that neither of us could have anticipated. The error occurred because of a link I included in the lengthy show notes. It was to my favorite song of Heather Welliver’s with The Shillas, called Faithful. For whatever reason, iTunes grabbed her song instead of the podcast, and Chooch confirmed this was happening with a test post. I’m happy to say that through my TDA, we now know not to link to .mp3 files as part of a wordpress with podpress post. Yay for learning new things! I have happily linked to it above, so NYAH NYAH, iTunes! Balticon is a Sci-Fi/Fantasy convention held annually over Memorial Day weekend in the outskirts of Baltimore, Maryland. This will be my third year in attendance, and my second as a participant. Come join Chooch and I as we do a live recording of our blended family podcast. Last year’s live recording included a discussion on family gaming. This discussion includes prior National Novel Writing Month participants P.G. Holyfield, Mur Lafferty, Nathan Lowell, Chooch and myself. Come and learn what it is, and how panelists either won or lost. Attend a live recording of a new story by Chris Lester in his Parsec winning story series, Metamor City. Join Chooch and I as we again host the New Media Party and costume contest. Light refreshments will be served and costumes are not required to attend. Tee Morris will DJ, Podcasting’s Rich Sigfrit will be the Master of Ceremonies, and Phil Rossi will perform an acoustic set after the costume contest judging. Judging for the costume contest is expected to start at 11:30 pm. My all-female podcast be recorded live with a very distinguished panel of published authors: Philippa Ballantine, J. R. Blackwell, Christiana Ellis, and Mighty Mur Lafferty. M.A. in PA and Jett Micheyl will also be there. There are so many talented and magnificent people that participate, I highly recommend this convention to any that have a of sci-fi/fantasy interests, and especially those with a love for new media. By all accounts, this is the best gathering of those producing podcasts and/or podcasting their written works. I’m exploring new possibilities for weight loss and exercise that I’m able to maintain with what is going on with my health. I’ve been doing South Beach’s Phase 1 for too long, considering how important I feel fruits, vegetables and high grains are to a healthy diet. I still believe in a low glycemic-index eating and continue to avoid white flour, white rice, and white potatoes. I am allowing myself any fruit and vegetable my little heart desires, and after excluding most fruits from my diet for a long time, I find fresh pineapple, apples and grapes to be absolutely heavenly. I am not drinking fruit juices, or eating dried fruits as they are too high in sugar for my goals. I’d generally call what I’m doing South Beach Phase 3, which is the maintenance phase. While on this path, as well as banishing high fructose corn syrup from my diet, I’ve been looking at a lot of food labels. I’ve also been checking out nutritional information from restaurants since that is where my real problem lies. At this point, I have my “at home” food under control because I don’t buy what I shouldn’t eat. Navigating a menu at a restaurant is treacherous because, except in rare cases, you cannot find calories/fat/sugar information once you’re in the restaurant. This leads to my newest obsession, which is the nutrition lists prepared by David Zinczenko, with Matt Goulding. They both write for Men’s Life magazine, and Matt is also the co-author of the book “Eat This, Not That” which is why you will find an alternative to the unhealthy item listed. The main link will take you to some very interesting links, and I think the first thing I’ve learned is to never go to a restaurant without a pick list of what is not ridiculously high in calories and sugar. When the Cheesecake Factory lists no fewer than ten single-portion menu items over 2,000 calories. Several more came were only slightly below 2,000. And yes, you can split it and take half home, but that is still over 1,000 calories in one sitting and not an insignificant number. They don’t list their nutritional information on their site, but I was able to find it elsewhere, but I have no idea if it matches their current offerings. The main site also will show you just how unhealthy some of the foods in our pantries are, such as the “Unhealthiest Juices in America” and “Best and Worst Breakfast Cereals“. Due to the latter, I actually threw a box away straight from my pantry and I’m no dummy when it comes to nutritional information. The lists don’t require a huge time investment, and are broken out into short bursts of information. As I’ve said many times recently, I’m absolutely shocked at the high level of unhealthy food that has become the standard rather than the indulgence. I’m wondering when corporate America will realize that killing off their customers with fat, sodium and sugar laden foods is detrimental to their bottom line. If they truly wanted to prove the “it’s the customers choice”, then why not put the nutritional information on the menu? Ruby Tuesday’s did it for awhile, but if memory serves this information has been stripped out. Applebee’s provides it for some of their dishes, but I don’t believe for the entire menu. Yes, it is absolutely the responsibility of the diner for what they put in their mouth and the mouths of their children. That is why I research so much, and try to learn from my mistakes. As someone with heart disease and diabetes on one side of the family, and multi-generational breast cancer on the other, these issues are in my face and cannot be ignored. I worry about those that aren’t faced with these ticking time bombs and may think “Just this one indulgence”, which may be more of a recurring habit on closer inspection. If it sounds as if this fat girl is trying to preach skinny dining on you, please know that I get the irony. I’m just trying to share the information I’ve found in the hopes of saving you extra time on the treadmill. Please feel free to comment, as I’m interested in others’ experiences and thoughts. The need to write this post came about as I was editing the latest episode of my new podcast, Girls’ Rules. I was yet again awestruck by my luck in meeting such intelligent, eloquent and creative women over the last few years. This isn’t the first time I’ve reflected on this. It was, after all, the impetus for starting the podcast. But this time my thoughts went down another path, one I’ve not truly explored before. I was reminded of something that my friend Paulette said recently, which was that she wished she could have met my Mom because she sounded … (Okay, truth? I have to confess that I was so overwhelmed at Paulette saying this that I don’t remember what she said beyond that.). It took my breath away, and I was unsteady for a moment in contemplation of Mom’s presence in my current life. Sitting here I feel it again. Is it sadness, gratitude or rage that I’m filled with this time? So many things that Mom has missed out on, not just seeing my current life, but more importantly the birth of her first great-grandchild as well as three of her beloved grandchildren graduating from high school. I celebrate loudly and passionately with my family at these things, but quietly and painfully miss her as these things occur. Luckily, my husband is always willing to lend me his shoulder to cry on and hold me tight until it passes. But hearing Paulette say that was a different thing entirely. It’s been marinating in the back of my mind since then as I chatted with extraordinary women on the phone, in real life or on the internet. 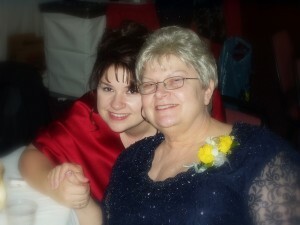 In recent years, I’ve met women that Mom would have adored. Whether because of their intelligence, creativity, nurturing spirit, raw talent, quick wit, or not-so-secret identity as a force of nature. I know she would have adored them, because she held my best friend of 22 years in her heart as if she were another daughter. When she saw the extraordinary, she appreciated it. I also know that had she met some of my new friends, and one inspirational male in particular comes to mind, that she would have finally written the book that she always wanted to write. 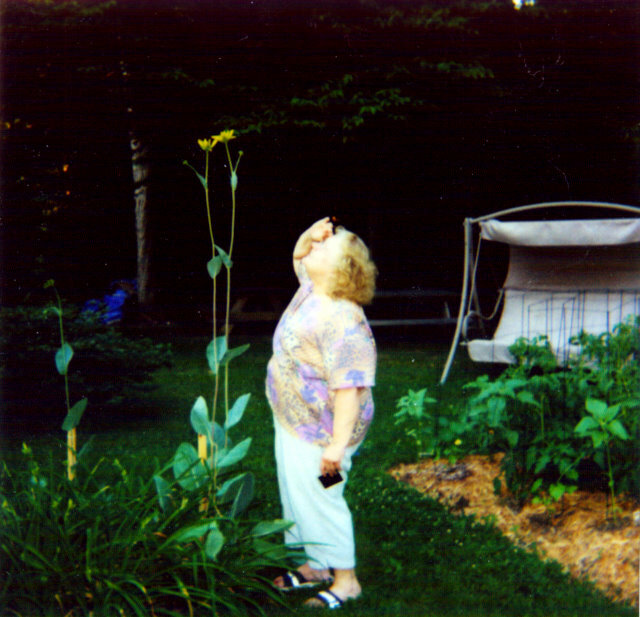 Mom was a creative spirit, and she had many different outlets. She loved to paint and draw and had a true gift for it. She was also a talented writer, but she “never had time” to invest any real time in it. I think it was something she was putting off until retirement, as her work and family kept her so very busy. I imagine that she would have taken up the NaNoWriMo challenge with Chooch and I the last two years, and I know that she would have won both years as she both loved a challenge and thrived on deadlines. I’d say the place where she always made time for her creativity was her garden. Flowers growing everywhere, for at least three seasons of the year. It was as if she bent nature to be her palette, creating colorful displays for anyone that walked by to see. I equate spring flowers so completely with her, that the first spring after she passed I was inexplicably furious and looked away from any flowers that dared to bloom without her here to appreciate them. Thanks to the unknowing and loving act of a wonderful sister-in-law, that has passed. I now look to each spring with great excitement over every flower that displays its’ beauty for the world to enjoy. I look forward to having my own patch of dirt scratched out for me to play in someday. But I keep coming back to that unwritten book of hers, and I’m left with wondering what she would have written. I found a few hundred words on her hard drive of a story she had started, and I think she was off to a great start on fiction. She also had expressed interest in telling the story of her very colorful and difficult childhood. That’s the story I wish she had written, as it was the one that shaped her into who she was. Remembering some of her stories it would have been a fascinating read, for me at least. And in case you’re wondering, you would have adored my Mom. She was the purest form of awesome, and her imperfections lent humanity to her otherwise bigger-than-life heart. Happy Mother’s Day, Pocket Mom. All my love, Marshmar. I’m going through my Facebook account and stripping out some info due to the continuing privacy concerns, and came across this “25 Things About Me” note I had posted from February of 2009. I was curious to see what had changed in the last 14 months, so am attaching here and updating any changes in parenthesis. 2. I will never stop missing my Mom, or wishing I had shown her more appreciation when I was younger. 3. I forgive myself for not appreciating her more when I was younger, because she knows all now, including how I feel. 6. I’m forever grateful to two friends that pushed Chooch and I along the path towards each other, even though our new life together seems to have cost me their friendship. 7. I love banana flavored Runts. They taste better than bananas. 8. I don’t think you can truly examine something fully if you don’t do a puppy dog head tilt. 11. Foo Fighters are to my 2000’s what Depeche Mode was to my 1980’s. 14. I lost most of my relatives in the grieving after my Mom died. She was the glue. 17. Our bedroom will always be the messiest room in the house. 18. I will never eat pork again, and may eventually be a vegetarian. 19. I love photographs, especially of my family and friends. 20. I’m enjoying the two separate aspects of my life more than I thought I would. I think I’m going to keep them separate. 22. I live in a world where Wash didn’t die. I need him to still be alive in that world. 25. I do believe in fairies. I do. I do.